The world’s biggest meat alternative production facility has officially opened at Quorn Foods’ Belasis site in Billingham, in the North East. The factory expansion of 9,500m2 will double production capacity of Quorn’s core products, adding approximately 20,000 tonnes per annum. It is part of a £150m investment by Quorn Foods, reflecting an increase in flexitarian and vegan diets, and the fact that the UK is the most advanced meat-free market in the world. The state of the art production facility will produce 1.33m packs of Quorn products per week, equivalent to the meat produced by 1,600 cows. The efficiency improvements the expansion will deliver will help Quorn Foods continue to reduce its carbon emissions per tonne of food produced, already down by 35% since 2012. Opening the facility, Tees Valley Mayor Ben Houchen said: “Huge household-name businesses are thriving in this region. Quorn Foods’ products are sold around the world, making it an important part of our export economy. It is just one example of how our skills base will help businesses and with them, our region, succeed in an outward-looking post-Brexit world. The move closely follows Quorn Foods’ elimination of 297 tonnes of non-recyclable plastic from its supply chain and the pledge to achieve 100% recyclable, reusable or compostable packaging by 2025. With scientists predicting a climate change point-of-no-return as early as 2035, flexitarian and meat-free diets have an important role to play. The green-house gas emissions from a bag of Quorn Mince are 90% lower than beef mince. 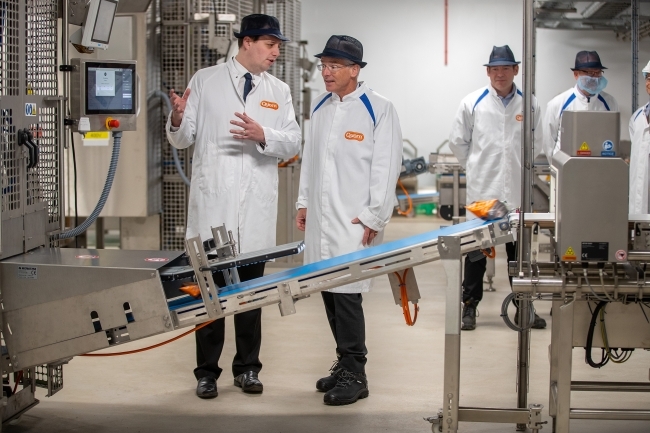 The factory expansion builds on Quorn Foods’ strongest ever year of growth, a £7m investment in a Global Innovation Centre at its Stokesley headquarters, and sees the company stay on track to become a billion-dollar business by 2027.